In the jewelry business, we spend so long talking about the need for the 4Cs of diamond classification, that it’s easy to forget sometimes that the Color of those Cs is actually a lot more flexible than you might imagine. The ideal diamond color is usually seen as being “white” which, of course, means colorless in jewelry terms, but diamonds come in a wide variety of colors and shades. A completely colorless white diamond is a pure diamond, by classification, and the purer it is, the whiter it is considered to be. So do we just dismiss any non-white stones as oddities or simple curiosities? Well, no, of course we don’t. 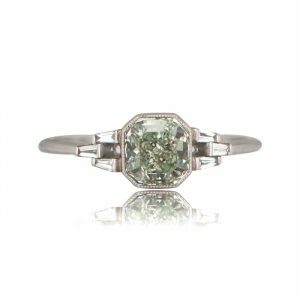 Experience tells us that stones considered “imperfect” for the purposes of classification and description can be spectacular in their own right, and non-white diamonds deserve their place in quality engagement rings just as much as their purer brethren. As expected, the vast majority of diamond engagement rings contain stones that are white, and these are what we instantly imagine when we talk about engagement rings generally, but the impurities that find their way into diamonds can result in anything from brown and yellow – caused by the inclusion of nitrogen, blue – caused by Boron, and even green, black, pink, orange, purple, or red which can be caused by a combination of impurities and deformation. Technically, only diamonds ranging from white to light-yellow are classified using the standard GIA classification, with more extreme shades of yellow, or other colors being classified within a different grading scale. These other colored stones are referred to as fancy colored diamonds so as to distinguish them from the “purer” end of the scale. 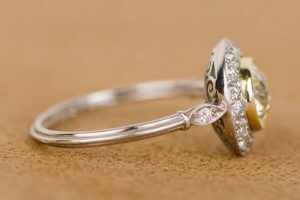 Despite the long-held preference for white diamonds, yellow and brown are actually much rarer, and good examples look stunning when set into vintage engagement rings. It’s possible that so few diamonds at the yellow end of the color scale find their way into fine jewelry not just because of their rarity, but also because they may not have been considered desirable in the early days of commercial diamond mining. It may even be the case that it wasn’t realised that they were diamonds at all. Whatever the reasons, we now know that fancy yellow diamonds, in particular, are just spectacular. One can only imagine the conversations of the first ring designers and diamond cutters when they tried to convince clients that the fancy yellow stone there were looking at was, in fact, a diamond. Even moreso when they tried to pull the same “trick” with a fancy green diamond or other exotic color! Most untrained eyes would be unable to confidently distinguish a diamond of the colorless “D” classification to one some way further down the scale, but a fancy yellow diamond is an immediate talking point, and even more so when it is set atop a beautiful platinum band. Such stones are also very well suited to other items such as earrings, as the increased color presence demands immediate attention, and many fancy colored diamonds find their way into the jewelry accessory market. We all love a pure, colorless diamond, but we exclude yellow and the fancy colored diamonds at our peril.